Gone are the days when you had to spend a fortune and months of coding to get your website up on the internet. It’s 2018, and platforms such as 000Webhost are revolutionizing how the world sees and uses the internet. I’m pretty sure you’ve heard of 000webhost.com It’s one of the most popular “freemium” (having both a free, as well as paid package) hosting companies on the planet. With over 29,659,751 clients, 20,000+ new clients EVERYDAY and 24,894,152 live websites, there aren’t many out there who are completely oblivious or new to the name “000webhost”. I personally used to spend a lot of money on servers before I heard of 000webhost, and after using them for almost a year, I think it’s time I share this 000webhost review with you folks regarding how good (or bad) their service exactly was. The most unique, exclusive and primary feature about 000webhost is its pricing structure! It’s literally free! Yeah. So that’s the reason I’ve mentioned it at the very #1 spot on this 000webhost review. Let me clear it right now, that the “free” version, really is free. There are no strings attached, no “secret task” involved, nothing! You signup, you host your website, as simple as that. Although they also have a better, more feature rich premium package which you can buy if you liked their free version. The unlimited plan for $3.49 has almost everything unlimited, including unlimited domains, unlimited E-mail accounts, unlimited MySQL databases, 2X WordPress Speed etc. While the 7.95 plan too offers unlimited websites, it has more features and addons than the $3.49/month plan, such as a free SSL, daily backups, deluxe live support etc. They even offer a free domain and free CDN, that’s more than most other hosting companies seem to offer out there as far as my personal experience goes. In my own case, I shifted from the free to the $7.95 plan within 7 months of me signing up on the free server, although now I’d totally say I should have done it sooner. Another important aspect I consider why finalizing a webhost for my businesses which feed my family is “Speed”. If a website isn’t fast enough, no matter how good you are at SEO, how many thousand dollars you spend on ads, you may get people to click on your site, but most would hit the back button before it gets to load up completely. So in a nutshell, all the efforts and investment goes down the drain. Well, 000webhost is fast, really fast. 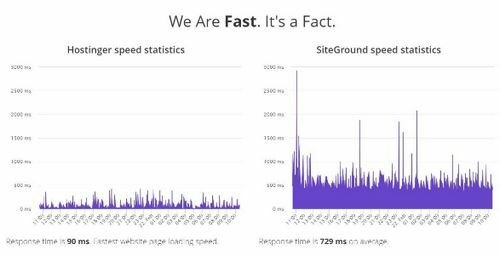 But I believe “data speaks louder than words”, so here’s a real-life chart showing how it’s faster than Siteground, one of the most popular and more expensive hosting companies out there. I believe that settles it, doesn’t it? So till now, we’ve established it’s free, and cheap on the paid plans, and it’s fast. Let’s have a look at what other miracles the company has in store for us. Why did I “quote” the “Guaranteed” part? Cause hey, every other hosting company, no matter how expensive or cheap out there “claims” to provide you 99% uptime, but do they actually? Where is the proof? I’m doubt you’ll find any. But that’s not the case with 000webhost and that’s the reason why I’ve quoted that last part in the headline. The normal stigma associated with free hosting is that they aren’t worth it, or that they won’t provide you the tools or packages that are most basic for the functioning of a website, and trick their users into buying a premium service. As I already said, I comfortably ran my website on its free version for over half a year before moving to the paid plan and that was only because my traffic and other requirements grew. My point is, 000webhost includes everything that a normal paid package from any other company out there provides, including PHP, MySQL, WordPress and everything else. They even provide the “one click script installer” which almost no other free web host provides. With this, you can install WordPress in one single click, no download/upload of files required. Not only saves time, makes things really easy. And finally, the last reason why I’ve been singing so many praise songs for 000webhost is because of its free website builder. Even though this is the first time you’re setting up a website, and you’ve never ever written or even seen a line of code, and you’ve no idea how to setup a website, well none of that matters. 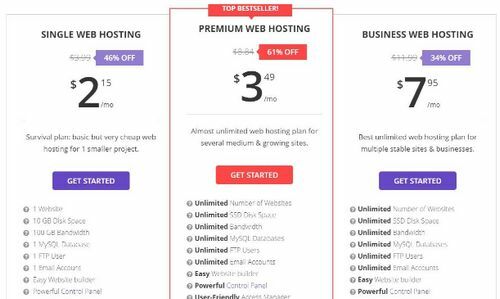 000webhost’s free website builder is the only tool you’ll ever need, you simply select a “layout” for your website from a gazillion pre-designed templates. Simply “edit” the content which is easier than teaching your grandma how to text, and publish. So that’s a wrap folks. Now what do I personally think of the platform? Obviously I’m in love, or I wouldn’t be running 4 of my websites on them, right? The process from “signup” to “a published website” literally can be completed in less than 10minutes! (Nope, I’m not kidding). With their one click installer, pre-designed templates and one click publishing, there isn’t really a lot left for you to do, rather than just decide the name of your websites at most maybe. So bottomline, if you’re looking for a paid, or even a paid hosting plan which doesn’t burn a hole in your pocket, you should totally give 000webhost a try. Infact, they’re also offering a 30-day free “premium package” trial, so you’ll get all the features their paid plans have, for free. Just try them out, and then you can decide if you wish or don’t wish to go with them.